However, the rest of the run remains, and there is still time to see one of the most intense evenings in dance you are likely to see this season. Sophocles’ searing play touches on some of the profoundest issue of human life: family versus the state, love versus politics, the gods versus man, feminine versus masculine values. 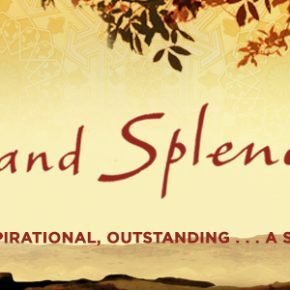 Last week I enjoyed a production of A Thousand Splendid Suns, a stage adaptation of Khaled Hosseini’s novel by Ursula Rani Sarma and directed by Carey Perloff, at San Francisco’s American Conservatory Theater. The title, from a 17th century poem written by Saib-e-Tabrizi as he passed through Afghanistan on his way from Persia to India, celebrates Kabul’s landscape and people. Taking place over the past forty years of Kabul’s history, the play reveals more of the Afghan nationals’ raw fortitude than the place’s evocative beauty. Yet, the strength and determination of main characters Laila and Mariam becomes its own kind of splendor. This month’s submissions represent literal or metaphorical conversations: snippets of overheard or spoken dialogue, responses to cultural ideas or to others’ writing, or poetic tension among various ideas or emotional states. Some contributors directly show people talking, or interacting in different ways. Joe Balaz offers up two poems written in the dialect of Hawaiian Pidgin, intending to preserve the language and illustrate its capacity to convey thoughtful poetry. His poetic subjects talk conversationally to readers, expressing confidence in their hunting prowess and in everyday life. Tony Nightwalker LeTigre contributes poetry about non-judgement and being happy in the moment, enjoying skate parks and memories and hot chocolate. His work reminds me of another local urban character from San Francisco: Lisa Demb, the creator of the ‘Happy Armageddon’ street art series, colorful pieces about how change, even the supposed ‘end of the world’ that we fear, could be viewed as a source of wonder and adventure rather than simply destruction. Tony’s other piece this month provides character sketches of folks out and about in Portland, Oregon, in various real and imagined encounters. Joan Beebe’s poetry honors the strength of married love, which can be seen as one long conversation. Another piece honors her pilot nephew Kyle. Some ‘conversations’ are less literal and come across as dialogue between seemingly opposed ideas. Mahbub’s short poetic lines convey bursts of thought, illustrating the continual tension between love and fear. Donal Mahoney’s character sketch grapples with the seeming opposites of life and death and ultimately celebrates life through showing an older man who interacts more naturally at wakes than parties. He’s found a way to make peace with mortality, although perhaps not the eventual loss of his much-loved wife. J.J. Campbell’s poetry evokes a sense of loss, as pieces show heartbreak or a diminished belief in himself and those around him. The lack of capitalization and short lines of his writing further emphasize the somber mood. 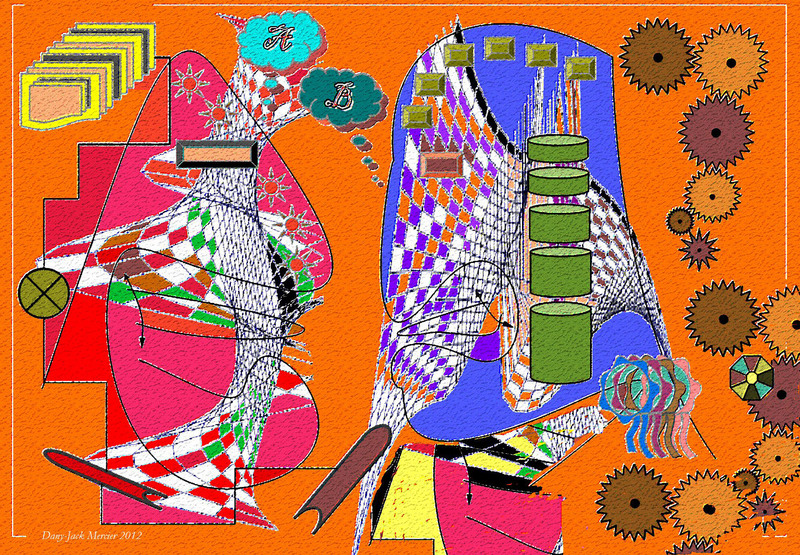 Yet he still believes in himself enough to create, to not give in to total obliteration. Other writers create pieces in response to other cultural ideas, review books, or draw on other writers’ thoughts to convey their own. Vijay Nair critiques strains of Western feminism that he believes focus only on female sexual self-expression to the exclusion of other aspects of female and human life. Christopher Bernard finishes up Trumplandia, his poetic sequence where he channels the energies of departed poets in the canon, including T.S. Eliot, Basho, and Emily Dickinson, to respond to the absurdity of the U.S. political situation. Bernard also reviews San Francisco’s Curran Theater production of the musical Fun Home, based on Alison Bechdel’s graphic novel of the same title, which comments on family, sexuality and secrets through mordant (and morbid!) wit. Randle Aubrey speculates on how the USA may be ripe for the rise of a new political party focused on the interests of labor and the working classes. 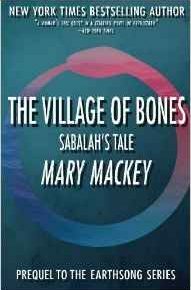 Christopher Bernard provides a review of Mary Mackey’s novel The Village of Bones: Sabalah’s Tale, taking a thoughtful look at her book’s hypothetical Goddess-worshiping, Neolithic European society while acknowledging its beauty. We encourage you to join the conversation by reading these submissions and leaving comments for the writers. RSVP appreciated but not required, all welcome, all ages, light snacks provided, bring books to read from and sell, bring something to read in the open mic, or just bring yourself and enjoy the night! wuz wun really good pig hunter. tough and determined in da bush. who da king of da mountain wuz. and he wuz always cool. out deah in da rain forest. wit wun good catch foa his kitchen table. and she just had to take wun picture. He gets his game on all levels. Mary Mackey’s new book is a prequel to Earth Song, a highly praised series of novels set in a speculative world in the millennia before the blossoming of the ancient civilizations of Mesopotamia. Earth Song, beginning with The Year the Horses Came, follows the epic story of Marrah, the “savior of her people” and later princess-queen of Shara, a settlement sacred to Mother Earth, and of her daughter Luma, who carries on Marrah’s tradition of leadership and heroism. The prequel takes us back a generation – to 4387 B.C.E. – to tell the story of Marrah’s own mother, Sabalah, Daughter of Lalah, and of Marrah’s birth and the dramatic, celestial, and nearly fatal events surrounding it. GROWING UP GAY IN A FUNERAL HOME IN THE STICKS—REALLY! The Curran Theater, after a two-year makeover, reopened in January with the Tony Award–winning musical “Fun Home,” based on the controversial graphic novel of the same name by Alison Bechdel. The novel caused some controversy several years ago when it was placed on the syllabus of a public school English class and objected to by a few parents. A San Francisco audience will probably wonder what the fuss was all about. The father has a secret; so does the daughter, which, she discovers, under macabre and tragic circumstances, is in exact parallel to her father’s. They are both gay. Later (no spoiler here, as the show lets us know early on exactly where we are headed) the father is killed in a road accident not long after his daughter tells him she is a lesbian, and there is some question whether or not his death was a suicide. The story takes a few weak stabs, none convincing, at exploring whether or not it was. From this not always sharply focused material (there are at least three storylines that clash as often as they cohere), a musical has been made that is about what one might expect: a sometimes strained attempt to find a universal core in a sometimes distractingly bizarre complex of situations by forcing perfectly nice people to break into soaring if sometimes shapeless melodies, boisterous but sometimes unconvincing ensembles, set pieces that come out of nowhere and then return there, scenes of revelation, love and despair (and vice versa), and question-begging speeches and storylines that can only be based on fact as no fiction writer would have left us caught so inescapably in reality’s stubborn refusal to make sense. Yet the show is more than worth a visit, if only because the situation it depicts, as messy as reality, is close to what many gays in this country have had to confront for a very long time indeed, even as homosexuality has become more accepted as a natural and valuable part of the human condition. This musical helps mark how far at least our urban culture has come over the last generation, and as a moral, if not always artistic, triumph, it is to be encouraged and its creators and performers applauded. The daughter, Alison, is performed by three “actors.” (May I interrupt our show at this point to make a plea that we call female actors actresses once again? Calling women by masculine cognomens is, I submit, sexist; speaking personally, I disapprove of any form of sexism, including feminist sexism. 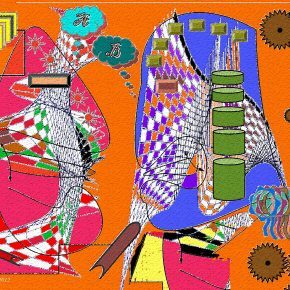 Differences, I believe, should be honored and not erased, but they can only be honored if they are named.) These are Grown-up Alison, a cartoon artist who narrates the story, played persuasively by Kate Shindle; Youngest Alison, played (on the evening I saw the show) with bouncy vim by Alessandra Baldacchino; and College Girl Alison, played, in the best performance of the night, by a pitch-perfect Abby Corrigan, who looks like she walked out of an updated Archie comic with wondering eyebrows and an expression of perpetual innocent shock. These three share one of the show’s best moments, in a trio near the end that nicely captures the confusion of identities that lies at the heart of being human at the best of times. One other performer was especially impressive, though her part is comparatively small and she is spared having to break into song. This was Karen Eilbacher, who plays Joan, revealer to the sexually uncertain Alison of her own gayness in a sweet and funny scene with Abby that is one of the show’s loveliest and most touching moments. Eilbacher does a great deal with a cool mien and perfectly gauged body language, to say nothing of a killing Mohawk. Alison’s mother is played by Susan Moniz; it is a bit of a thankless role, as the mother’s motivations for staying with Alison’s father remain as murky as the man himself is. Alison’s younger brothers are played with energy and charm by Pierson Salvador and Lennon Nate Hammond, and with Baldacchino have one of the show’s best moments: a whacky ensemble in which they act out a make-believe TV commercial for their “fun home.” Too bad I couldn’t hear all the lyrics in an otherwise well-mic’d show; the ones I could hear were some of the show’s funniest lines. The objects of the father’s interest down the years are nicely played by Robert Hager. 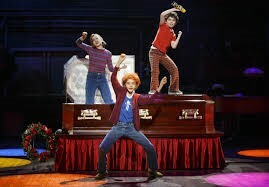 The instrumentals were performed onstage by the Fun Home Orchestra; John Doing’s percussion and Philip Varricchio’s clarinet made especially memorable contributions. Christopher Bernard is co-editor of the webzine Caveat Lector. His novel Voyage to a Phantom City came out in 2016; his new book—a collection of poetry called Chien Lunatique—will be published in May. I’m up and I’m down and sideways too. To a faraway home, where my heart and soul lie. I still dream of blue skies waiting for me. And my plane and I are flying free.